A chat with animation master Hayao Miyazaki on receiving a special achievement Oscar. 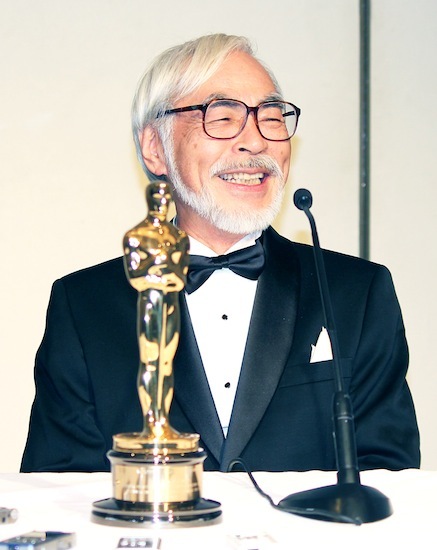 For extraordinary distinction in lifetime achievement and exceptional contributions to the state of motion picture arts and sciences, honorary Academy Awards were presented on Nov. 8 in Hollywood, and among the recipients was anime director Hayao Miyazaki, 73. He is only the second Japanese director to receive the award, following the late Akira Kurosawa in 1990. Also recognized this year were Irish actress Maureen O’Hara, 94, and French screenwriter Jean-Claude Carrière, 83. The average age of the recipients is 83, Miyazaki being the youngest. Miyazaki was interviewed after the ceremony. Q: How do you feel about winning this award? A: What surprised me the most was that the great actress Maureen O’Hara was honored at the age of 94. I never dreamed that I would be able to meet her in my lifetime. I thought to myself, as long as you are alive, unexpected things can happen. Q: What did you think when you held the Oscar in your hands? Q: What were your impressions of the ceremony? A: Being able to meet Maureen-san was more emotional for me than anything else. She was just wonderful. I told her quietly, so that others couldn’t hear, “You’re very beautiful,” because I really thought so. The stars from the black-and-white era are the real stars. When that beautiful woman turned around, her silhouette was exactly like it was in those days. Wrinkles and age spots don’t matter — her beauty took my breath away. Q: What does the Academy Award mean to you as a director? A: To tell you the truth, it doesn’t matter. I never had those kinds of aspirations. When I decided to do animation, the Academy Award was not my goal; it was not even a consideration. You may get mad if you don’t receive an award. But even if you receive one, that doesn’t necessarily mean you’ll be happy. And it doesn’t mean that your work suddenly gets better. You decide what the outcome will be. You must decide when to stop making movies. An award does not make that determination. What makes me glad that I received the Academy Award is the fact that Maureen-san was still alive. During the ceremony, I told her, “You were really great in ‘How Green Was My Valley’ (1941).” She replied, “John Ford was a very scary director.” I was happy to have this brief conversation with her. “You never know what will happen in this life,” I thought. Q: Any thoughts on being only the second Japanese director to receive an Oscar? A: I wonder if Kurosawa-san also did not want to receive it. I think that receiving an award for your body of work is meaningless. Movie-making is the most vivid experience. “I made it. Take a look. What do you think?” After that, it’s okay if you win an award, or even a lifetime achievement award, which basically means “you’ve been doing this for quite a long time.” But in reality, getting an award doesn’t change anything. I don’t see any meaning in any kind of award. I think it’s something we would be better off without. Q: How do you keep your creative impulse? A: My motivation falters every time. But one day, I suddenly think, “This won’t do,” and try to get my energy back. This process repeats itself, to the point where even when I go to my studio, I’m more likely to fall asleep than stay seated at my desk. But I always wake up. A: A feature would be impossible, but if there’s a chance I would like to be involved in short films. Since my fellow honorees today are 94 and 83, I felt like I was still a kid. So rather than say I’m retiring, I would like to do what I can. I’m not trying to give myself a pep talk, and even if I did it would be no use. I just want to continue doing whatever is within my power. I think I will continue to use paper and pencil, canvas and paintbrush, or pen and ink all my life. Even if I can’t do that, I think I will keep drawing. Whether as work or just as a hobby, I still have no idea. Q: What would your future projects be? A: I think they would have to be something that I want to do, but at the same time something that would probably be meaningful for my staff to do. Not the kind of thing where I just help in some way and then I’m done with it. If that were the case, I wouldn’t want to go to the studio every day. Q: Any words for Japanese animators? A: This is not limited to animators, but if people are prepared to be poor when they go into a line of work, something will come of it. When I became an animator, the word “animator” did not register with anybody. The fact that such a job even existed was not recognized. Rather than a path called “animation work,” you end up walking an untraveled path. Knowing that, all you can do is try your hardest. Miyazaki appeared at the ceremony wearing a tuxedo that his wife bought at a department store. He said that he will donate his Oscar to the Ghibli Museum. To Miyazaki, who passionately pursues projects that he wants to do, it appears that the Academy Award doesn’t mean that much. Rather, the precious memory he will take away from the ceremony is meeting Maureen O’Hara. After the ceremony, he was positively beaming as he told reporters about his encounter with Maureen-san, looking like a young boy talking excitedly about meeting a girl that he liked.